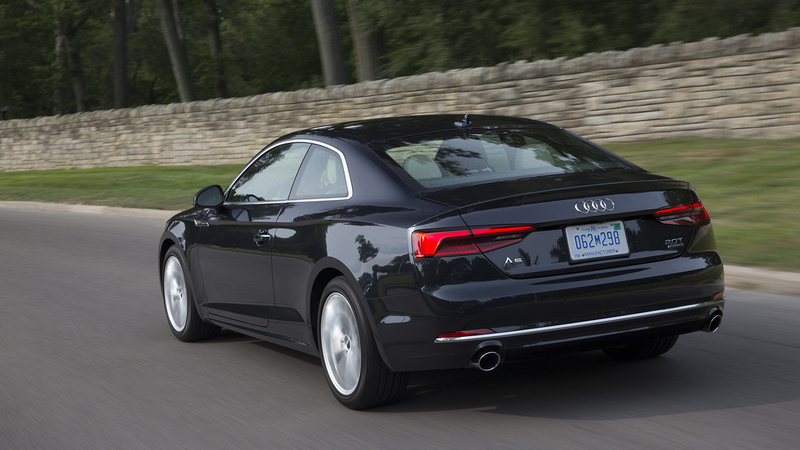 For such big car, the Audi A5 gets along handily with just two liters of displacement. Our test car came with the Prestige Package, driver assistance and the active damping suspension. The A5 definitely has curb appeal. In fact, one of our trick-or-treaters–well, a parent of a goblin and/or ghoul–asked if they could have the Audi instead of a piece of a candy. It definitely turns some heads, even though our test car wore some very un-Audi-like white paint. The interior is just as sculpted. Comfortable seats, perfect steering wheel, solid switchgear. Few automakers do switches and knobs like Audi. Everything has just the right click to it. Controls didn’t take long to figure out. The radio volume is controlled by an actual knob. Some will complain because the knob is located down by the shifter, but when you’re driving, it falls into hand. One thing didn’t thrill me about the driving experience, and I have mentioned it before: the shifter. You rock it forward for reverse and back for forward. Park is activated with the push of a button. I got used to that arrangement, but someone here on staff almost made a mess by assuming that park was located at the top of the PRNDL–you know, where you’d expect it. It’s got all of today’s bells and whistles, too. The traffic sign recognition feature is cool, as speed limit postings and the like are displayed beside the speedometer. I didn’t get to try out any of the crash avoidance features, but they sound cool. I rode in the back seat, too, for a bit. Once you’re back there, it’s pretty roomy. It’s no long-wheelbase limo, but for a coupe, it’s pretty good. Is it an M3/M4 alternative? Likely not, at least for most of us. But if looking for a solid, all-weather coupe in this price range, it’s a definite contender. Most car people look upon the 1970’s with distaste. The “Malaise” era brought us emissions choked V8’s that somehow produced feeble power AND terrible gas mileage simultaneously. Performance cars generally only looked the part, with even the once-mighty Corvette just a shadow of it’s former self. This was the era of the “Personal Luxury Vehicle”, and sales of Thunderbirds, Grand Prix, and Cutlass Supremes soared. This Audi A5 reminds me of those smooth-riding personal luxury coupes. It’s very stylish, extremely comfortable, and just sporting enough to give the driver a smile every now and again. These cars (like the A5) weren’t intended to hit the track, autocross course, or drag strip. They were intended to cosset, coddle and make the driver feel like they had “arrived” with decent social standing. The new A5 is better than the land-barges of the 70s in nearly every possible way, but the mission is similar. This is an extremely comfortable machine with just enough performance to keep the driver entertained. The silky 2.0T goes about it’s business in an ultra-refined manner, fitting with the mission of the car. 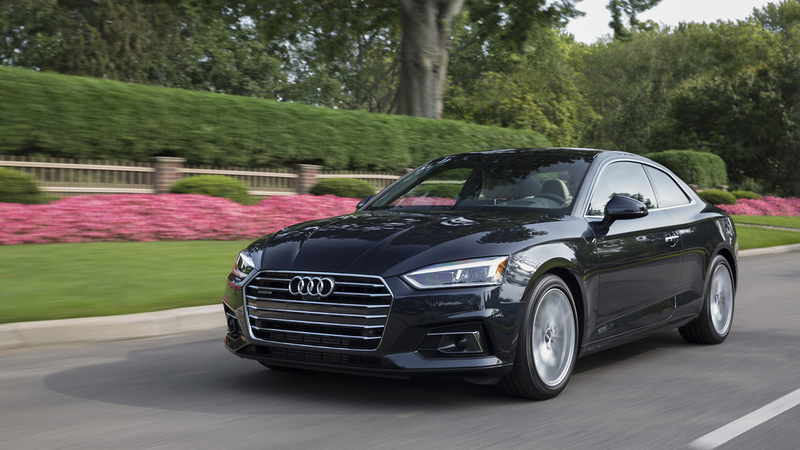 The A5 will boogie if you insist, but it’s most at home cruising at moderate speeds, enveloping the driver with it’s excellent sound system and myriad of features. The A5 won’t get your heart pumping, but that isn’t it’s aim. It aims to soothe, not excite. While it isn’t a good choice for driving in anger, it would be a nearly ideal partner for the grid-locked daily commute that many of us have to deal with. Now they just need to offer a “Diamond Jubilee” edition! This and the A7 are two of the best looking cars on the road. I didn't get to drive one of these, but I did drive a S3 recently. I was impressed. It had been a long time since i had driven an Audi, and although I don't think it would be a great track car, as a daily it would be hard to beat. They've come a long way since my old 100LS. I see a ton of these in central NJ. As an aside, these are one of the last generic German luxury coupes you can get with a manual transmission, although it's only available with the base 2.0T engine. We drove an A3 quattro - which is admittedly at least $10,000 cheaper than this car - and really weren't impressed. It drove well enough I guess, (the 330i xDrive was much more engaging), but it just wasn't a very pleasant place to be. Especially considering the price.